The image below was taken 20 to 25 years ago by Jim Chatfield using a 35mm camera. It shows Erik Draper's size 12 shoes positioned to illustrate mulch piled over 2 feet high. The three of us used this image for years in numerous training programs to teach against this horticultural horror (volcano mulch, not Erik). 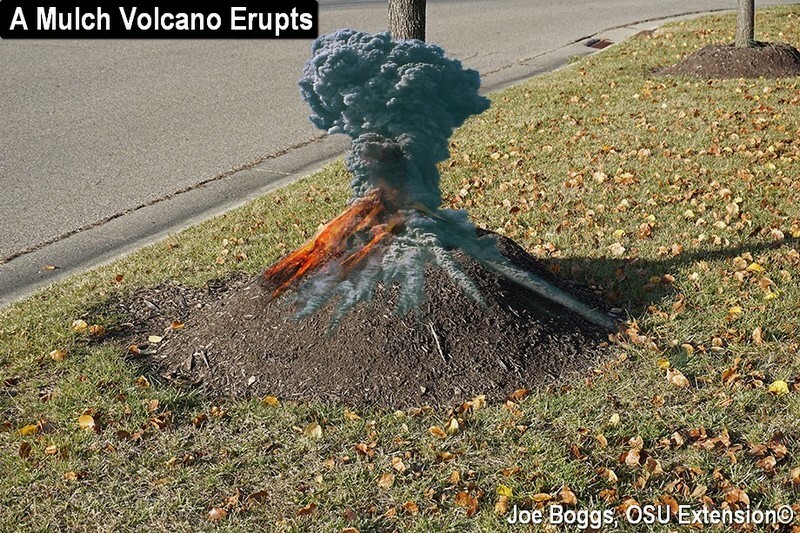 Of course, there have been numerous efforts by other Extensioneers, Master Gardeners, and our Green Industry to educationally eradicate mulch volcanoes (a.k.a. mulch mounds). There has been some success. I can count on provoking groans from audiences of horticulture professionals or Master Gardeners by showing them pictures of mulch volcanoes. The impact is so profound, I commonly hear groans lingering throughout my presentations! And yet, mulch volcanoes continue to erupt. Indeed, this mulch rant was incited by a visit to a local hospital yesterday where my wife had a minor medical procedure. Nothing serious, but I spent the wait-time cruising the hospital's landscape. Unfortunately, the most striking feature was new mulch formed into high mounds: mulch volcanoes were erupting everywhere! Adding insult to injury was the peculiar practice of digging a "mulch moat" around the base of the mulch stratovolcanoes. Creating these mulch moats not only cuts existing tree roots extending into the surrounding soil, but the trench can prevent root regrowth into the soil beyond the moat. In essence, each tree has its entire root system confined to the area beneath its mulch volcano. ARRGHH! I'm certain the hospital is staffed by some of the best medical professionals in our region. However, as visitors and patients approach the hospital, they are greeted by clear evidence of far less than professional horticultural practices. Organic mulches such as aged bark mulch are a wonderful thing. They moderate soil temperatures, preserve soil moisture, suppress weeds, and as the organic mulch slowly decays, it contributes to the organic content of the underlying soil. The dark color of natural bark mulch also enhances landscape aesthetics. Of course, the availability of organic mulch dyes makes other colors available; shopping for mulch can be like using an artist's palette. Last season, I highlighted an exemplary use of mulch in Glenwood Gardens, Great Parks of Hamilton County (see BYGL April 27, 2017, "Glenwood Gardens: A "Volcano" Mulch-Free Zone"). They had followed all of the general recommendations for the proper use of hardwood mulch around trees. The mulch rings were as large in diameter as practical and mulch depths were no more than 2 - 3 inches. Mulch that found its way onto the tree trunks was pulled away from the trunk flare. Volcano mulch does not kill trees outright; if it did, people wouldn't do it. Instead, it produces subtle, long-term, ill-effects. Although bark mulch may at first appear light and airy, it will ultimately compact as it degrades to interfere with oxygen reaching tree root cells. Trees respond by growing roots into the mulch; however, the roots can become exposed as the mulch further degrades. Hew down and fell the hardest-timbered oak." Volcano mulch is a little axe.